Sophomores Junacio Henley and Jamir Shepard, and junior Dwayne Trahan shoot hoops after school in the Peery Center’s Large Gym. The Associated Student Body will hold the Winter Rally basketball game between students and staff in the Large Gym on Jan. 23. 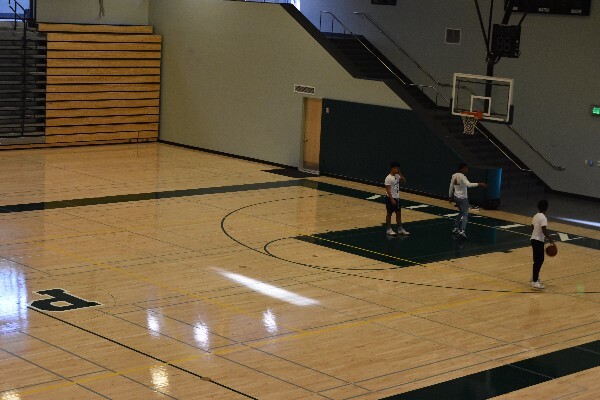 “We haven’t had a gym for some time so there is definitely some anticipation for a basketball game,” ASB President Jaiveer Sandhu said. Paly students will face off against staff in a Winter Rally basketball game during flex on Jan. 23 in the Peery Center’s Large Gym. 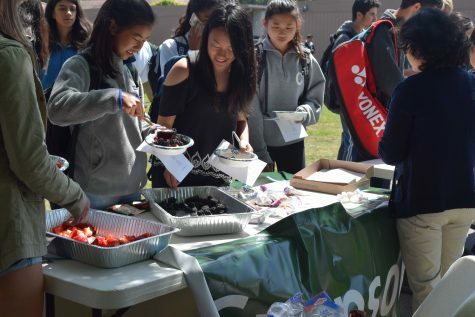 According to Associated Student Body Junior Site Council Representative Riya Kumar, the student team will be coed and seniors-only. In addition, the student team will not include players from the boy’s or girl’s varsity basketball teams. Paly’s cheer and dance team will perform at the game and ASB will announce the location of Prom 2018. The traditional format of the Winter Rally has been a basketball game, but last year’s Winter Rally was a soccer match on the football field because the gym was unavailable due to construction. ASB president Jaiveer Sandhu is confident that the seniors will be victorious. However, boys’ varsity basketball coach and the teacher team captain Peter Diepenbrock thinks otherwise. “Well, we normally dominate the inexperienced youth and I expect us to do the same this year,” Diepenbrock said.